"If the market demands it"
Never mind getting two push email accounts on Android 2.2 or iPhone 4; not only will Windows Phone 7 let you have the two Exchange Active Sync connections, but Microsoft senior director Paul Bryan told TechRadar that you can sync as many EAS email accounts as you like to your phone. "We can do more than two - there's no limit," he said, adding that he's syncing three accounts on his own phone. Both Hotmail and Gmail are adopting EAS for push email; two accounts are better than one but getting all your personal and work email delivered immediately will give Windows Phone 7 a big advantage. Delivering the context-sensitive tools for handling information like phone numbers and addresses was part of the reason that the copy and paste feature of Windows Mobile didn't make it into version one of Windows Phone, Bryan confirmed: "We ended up getting to the point where we said we need to deliver a great experience and there are certain things we can get done in this period of time and certain things we can't." 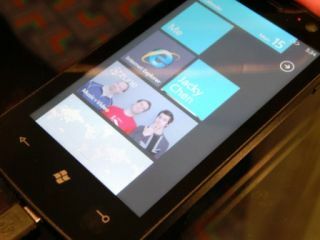 Brandon Watson, Microsoft's director of developer experience for Windows Phone, who enthusiastically described the list of features Microsoft settled on for the first version of Windows Phone as "the rocking it list," said that copy and paste would definitely return. "Do we need it? Yes. Is it coming at some point? Yes." Something else that might also come in future is the ability to build alternative browsers. "You won't see native code Opera or Firefox at launch," Watson confirmed to us, but he did hold out some hope. "We're always working with our partners to work out what makes sense. If the market demands an alternative browser, then we'll enable our partners to do that." Microsoft has already extended what developers can do in the phone emulator; you can now fake accelerometer data to see how your app responds to the phone rotating (or more sophisticated gestures) and they now get the same panorama and pivot tools the Windows Phone team used to build the experience hubs. Watson called the new Windows Phone Marketplace policies introduced this week incentives for "even more developers and different kinds of developers". Part of that is lowering the price (to $99 for unlimited pay-for apps and five free apps; further free apps have to be paid for, but Microsoft has already said that it's subsidising the actual cost of testing apps for the Marketplace). In the autumn Microsoft will enable beta testing for apps, so they can be distributed to what Watson calls "a small group of testers" through a private section of Marketplace. You can expect a similar mechanism for businesses that want to create their own internal apps, he suggests: "We're testing the mechanisms. It's not a huge leap of faith to look at that and see how privately distributed apps in the enterprise would work, to see how apps would be deployed." He expects Marketplace to be popular with developers, not least because he claims that the average sales price in Marketplace is "really high" and the policies for what will and won't be accepted are clear. "How can we make sure when people speak of Marketplace that it's not with a tone of derision? We want people to go 'wow, these guys understand my business!' And we don't want this air of secrecy around 'what can I do in the apps, what can I build on the platform?'" One thing developers will like: in July they get access to test phones. "That's the number one question I get," Watson told us. "Where is my device?" And what about the rest of us? It's still holiday 2010, and for the benefit of those of us outside the US, he narrows that down as "between October and New Year".